For other uses, see Spam (disambiguation). Spam (stylized as SPAM) is a brand of canned cooked pork made by Hormel Foods Corporation, based out of Minnesota. It was first introduced in 1937 and gained popularity worldwide after its use during World War II. By 2003, Spam was sold in 41 countries on six continents and trademarked in over 100 countries (not including the Middle East and North Africa). Spam's basic ingredients are pork with ham meat added, salt, water, modified potato starch (as a binder), sugar, and sodium nitrite (as a preservative). Natural gelatin is formed during cooking in its tins on the production line. Many have raised concerns over Spam's nutritional attributes, in large part due to its high content of fat, sodium, and preservatives. By the early 1970s the name "spam" had become a genericized trademark used to describe any canned meat product containing pork, such as pork luncheon meat. With an expansion in communications technology, it became the subject of urban legends about mystery meat and made other appearances in pop culture. The most notable was a Monty Python sketch which led to its name being borrowed for unsolicited electronic messages, especially email. Spam was introduced by Hormel on July 5, 1937. The Oxford Encyclopedia of Food and Drink in America states that the product was intended to increase the sale of pork shoulder which was not a very popular cut. Ken Daigneau, brother of a company executive, won a $100 prize that year in a competition to name the new item. Hormel claims that the meaning of the name "is known by only a small circle of former Hormel Foods executives", but popular beliefs are that the name is an abbreviation of "spiced ham". The difficulty of delivering fresh meat to the front during World War II saw Spam become a ubiquitous part of the U.S. soldier's diet. It became variously referred to as "ham that didn't pass its physical", "meatloaf without basic training", and "Special Army Meat". Over 150 million pounds of Spam were purchased by the military before the war's end. During World War II and the occupations which followed, Spam was introduced into Guam, Hawaii, Okinawa, the Philippines, and other islands in the Pacific. Immediately absorbed into native diets, it has become a unique part of the history and effects of U.S. influence in the Pacific islands. As a consequence of World War II rationing and the Lend-Lease Act, Spam also gained prominence in the United Kingdom. British Prime Minister Margaret Thatcher later referred to it as a "wartime delicacy". In addition to increasing production for the U.K., Hormel expanded Spam output as part of Allied aid to the similarly beleaguered Soviet Union. Nikita Khrushchev declared: "Without Spam we wouldn't have been able to feed our army". Throughout the war, countries ravaged by the conflict and faced with strict food rations came to appreciate Spam. The billionth can was sold in 1959, and in 2007, the seven billionth can of Spam was sold.In 2012, the eight billionth can of Spam was sold. Domestically, Spam's chief advantages were affordability, accessibility, and extended shelf life. At the time it was introduced, it was the only canned meat product on the market that needed no refrigeration. Statistics from the 1990s say that 3.8 cans of Spam are consumed every second in the United States, totaling nearly 122 million cans annually. It became part of the diet of almost 30% of American households, perceived differently in various regions of the country. It is also sometimes associated with economic hardship because of its relatively low cost. Spam that is sold in North America, South America, and Australia is produced in Austin, Minnesota (also known as "Spam Town USA") and in Fremont, Nebraska. Austin, Minnesota also has a restaurant with a menu devoted exclusively to Spam, called "Johnny's SPAMarama Menu". In 1963, Spam was introduced to various private and public schools in South Florida as cheap food and even for art sculptures. Due to the success of the introduction, Hormel Foods also introduced school "color-themed" spam, the first being a blue and green variety which is still traditionally used in some private schools of South Florida. Spam is especially popular in the state of Hawaii, where residents have the highest per capita consumption in the United States. Its perception there is very different from on the mainland. Hawaiians sometimes call it "Portagee Steak". 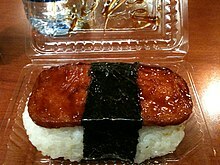 A popular local dish in Hawaii is Spam musubi, where cooked Spam is placed atop rice and wrapped in a band of nori, a form of onigiri. Varieties of Spam are found in Hawaii that are unavailable in other markets, including Honey Spam, Spam with Bacon, and Hot and Spicy Spam. Hawaiian Burger King restaurants began serving Spam in 2007 to compete with the local McDonald's chains. In Hawaii, Spam is so popular that it is sometimes referred to as "The Hawaiian Steak". There is even an annual Spam-themed festival on the island of Oahu that takes place every spring, known as the "Waikiki Spam Jam". Local chefs and restaurants compete to create new Spam-themed dishes, which are then sold in a massive street fair on Kalakaua Avenue in Waikiki. In 2017, Hawaii was plagued by a rash of thefts of Spam. Spam had long been a target of thieves in Hawaii, but the magnitude of the thefts ramped up, with incidents in which multiple cases of Spam were stolen at once. Local retailers believe organized crime was involved. This came alongside increases in thefts of some other retail goods, such as corned beef and liquor. The president of the retail merchants of Hawaii attributed the rise in retail thefts to a recent change in criminal law, which raised the threshold at which a theft would lead to felony charges by approximately $400. In Guam, average per capita consumption is 16 tins (cans) per year. It is also found on McDonald's menus there. The Spam Games also takes place in Guam, where locals sample and honor the best original, homemade Spam recipes. In the Northern Mariana Islands, lawyers from Hormel have threatened to sue the local press for publishing articles alleging ill-effects of high Spam consumption on the health of the local population. Sandwich de Mezcla is a party staple in Puerto Rico containing Spam, Velveeta, and pimientos between two slices of sandwich bread. After World War II, Newforge Foods, part of the Fitch Lovell group, was awarded the license to produce the product in the UK at its Gateacre factory, Liverpool, where it stayed until production switched to the Danish Crown Group (owners of the Tulip Food Company) in 1998. The United Kingdom has adopted Spam into various recipes. For example, recipes include Spam Yorkshire Breakfast, Spamish Omelette, and Spam Hash. Spam can also be sliced, battered and deep-fried into Spam fritters. "Spamilog", Spam with sinangág (garlic fried rice) and eggs, is a common Filipino breakfast combination. In the Philippines, Spam is a popular food item and seen as a cultural symbol. As a former US territory, Spam reached the islands similar to how it reached Hawaii and Guam: as a result of World War II rationing. Spam is commonly eaten with rice (usually garlic fried rice) and a sunny-side up egg for breakfast. It is prepared and used in a variety of ways, including being fried, served alongside condiments, or used in sandwiches. It has also been featured in numerous Filipino fusion cuisine dishes including Spam burgers, Spam spaghetti, Spam nuggets, and others. The popularity of Spam in the Philippines transcends economic class, and Spam gift sets are even used as homecoming gifts. There are at least ten different varieties of Spam currently available in the country and an estimated 1.25 million kilos of the meat is sold every year in the Philippines. During the rescue efforts after Typhoon Ondoy (Ketsana) in 2009, Hormel Foods donated over 30,000 pounds of Spam to the Philippine National Red Cross. Spam is often served with rice in Asia. In China, Hormel decided to adopt a different strategy to market Spam, promoting it as a foreign, premium food product and changing the Spam formula to be meatier in order to accommodate local Chinese tastes. In Okinawa, Japan, the product is added into onigiri alongside eggs and used as a staple ingredient in the traditional Okinawan dish chanpurū, and a Spam burger is sold by local fast food chain Jef. For the 70th anniversary of Spam in 2007, cans with special designs were sold in Japan due to its popularity, primarily in Okinawa. Following the March 2011 earthquake, Spam sales in Japan declined and Hormel shifted its focus to China although Hormel did pledge to donate $100,000 along with cans of Spam for relief efforts. In the summer of 2011, Burger King introduced its own version of a burger made of Spam, called 'BK Shot' Spam Burgers. These small burgers are filled with slices of the canned meat and were an attempt by Burger King to capitalize on Spam's popularity in Japan. In early 2014, Burger King also introduced the Spam and Cheese burger as a breakfast menu item. In Hong Kong after World War II, meat was scarce and expensive, so Spam was an accessible, affordable alternative. 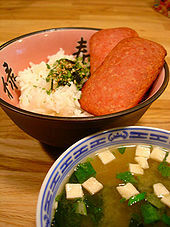 The luncheon meat has been incorporated into dishes such as macaroni with fried egg and spam in chicken soup, as well as ramen. In later years, the surfeit of Spam in both North and South Korea during the Korean War led to the establishment of the Spam kimbap (rice and vegetable filled seaweed roll). Because of a scarcity of fish and other traditional kimbap products such as kimchi or fermented cabbage, Spam was added to a rice roll with kimchi and cucumber and wrapped in seaweed. Spam was also used by US soldiers in Korea as a means of trading for items, services or information around their bases. In South Korea, Spam (Hangul: 스팸; RR: seupaem, licensed from Hormel by CJ CheilJedang) is popular with a majority of the population, and outranks Coca-Cola and KFC in status as a foodstuff. Today, South Korea produces and consumes more Spam than any other country except the United States. Spam is also an original ingredient in budae jjigae ("army base stew"), a spicy stew with different types of preserved meat. In Mandatory Palestine, demand for kosher canned meats increased as Spam became more popular during World War II. Canned meat was briefly mentioned during wartime from 1939–43, but the true boom in kosher canned meat came in 1945. This is when kosher canned meat became the key item in Europe's Jewish war victim relief packages. Then in 1946, the Chicago Kosher Sausage Manufacturing Company registered a patent for a kosher canned meat product called Breef. Made of beef, Breef has a similar texture to Spam but tastes like corned beef. Also, a kosher variant of Spam, known as Loof (Hebrew: לוף‎, a Hebrew linguistic play on meatloaf), was produced by Richard Levi, and mostly used as part of field rations by the Israel Defense Forces. A Glatt kosher version was also produced. It was phased out of field rations during the early 2000s and was finally removed from rations when production ceased in 2009. Beginning in 1940, Spam sponsored George Burns and Gracie Allen on their radio program. During WWII, Spam was not only eaten but was also incorporated into many other aspects of the war (grease for guns, cans for scrap metal, etc. ); it was so prominent that Uncle Sam was nicknamed "Uncle Spam". Other terms influenced by the product’s name include the European invasion fleet, or the "Spam Fleet". Furthermore, the United Service Organizations (USO) toured the "Spam Circuit". In the United States in the aftermath of World War II, a troupe of former servicewomen was assembled by Hormel Foods to promote Spam from coast to coast. The group was known as the Hormel Girls and associated the food with being patriotic. In 1948, two years after its formation, the troupe had grown to 60 women with 16 forming an orchestra. The show went on to become a radio program where the main selling point was Spam. The Hormel Girls were disbanded in 1953. Spam has long had a somewhat dubious reputation in the United States and (to a lesser degree) United Kingdom as a poverty food. The image of Spam as a low cost meat product gave rise to the Scottish colloquial term "Spam valley" to describe certain affluent housing areas where residents appear to be wealthy but in reality may be living at poverty levels. Spam was featured in an iconic 1970 Monty Python sketch called "Spam". Set in a café which mostly served dishes containing Spam, including "egg and Spam, egg bacon and Spam, Spam egg sausage and Spam, Spam egg Spam Spam bacon and Spam ", the piece also featured a companion song. By the 1990s, Spam's perceived ubiquity led to its name being adopted for unsolicited electronic messages, especially spam email. Because of its use in a line of a song in Monty Python and the Holy Grail, the title of the musical version of the film became Spamalot. Spam is the subject of the "Weird Al" Yankovic song "Spam", which is a parody of the R.E.M. song "Stand". Other offshoots of Spam in popular culture include a book of haikus about Spam titled Spam-Ku: Tranquil Reflections on Luncheon Loaf. There is also a mock Church of Spam, and a Spam Cam which is a webcam trained on a can of decaying Spam. In the 1982 film Sophie's Choice, the character Stingo brings a carton of Spam to his newly-rented room. Spam is referenced in Island of the Sequined Love Nun by Christopher Moore, where SPAM is explained as Shaped Pork Approximating Man, which was used to explain its popularity amongst Pacific Island Cannibals. Spam has also been mentioned in the online point and click game "Escape from Plastic Beach" from 2010 on gorillaz.com. In the game it's used as bait for a talking fish. Spam is celebrated in Austin, Minnesota, home to the Spam Museum. The museum tells the history of the Hormel company, the origin of Spam, and its place in world culture, including Hawaii where Spam is eaten daily by locals. Austin is also the location of final judging in the national Spam recipe competition. Competing recipes are collected from winning submissions at the top 40 state fairs in the nation. The Spamettes are a quartet from Austin who only sing about Spam in parodies of popular songs. They first performed at the first Spam Jam in 1990 and continue to perform at various events. Hawaii holds an annual Spam Jam in Waikiki during the last week of April. The small town of Shady Cove, Oregon is home to the annual Spam Parade and Festival, with the city allocating US$1,500 for it. Spamarama was a yearly festival held around April Fool's Day in Austin, Texas. The theme of Spamarama was a gentle parody of Spam, rather than a straightforward celebration: the event at the heart of the festival was a Spam cook-off that originated as a challenge to produce the most appetizing recipe for the meat. A rule of the event was that contestants had to be prepared to eat the Spam dish if requested by a judge. The festival included light sporting activities and musical acts, in addition to the cook-off. A can of low-salt "Spam Less Sodium"
Nutritional label for "Spam Less Sodium"
The ingredients of Spam vary according to variety and market; those of variety "Spam Classic" are: pork, ham, salt, water, potato starch, sugar, and sodium nitrite. Spam Low Sodium – "25% less sodium"
Spam Spread – "if you're a spreader, not a slicer ... just like Spam Classic, but in a spreadable form"
^ a b c Martin, Andrew (November 15, 2008). "Spam Turns Serious and Hormel Turns Out More". The New York Times. Retrieved May 23, 2010. ^ "Spam – Postwar Popularity". Hormel Foods. 2010. Archived from the original on December 15, 2007. ^ Campbell, Belinda; Clapton, Barbara; Tipton, Catherine (2002). Food Technology. Heinemann. p. 20. ^ Jones, Lisa (October 2006). Men's Health. Rodale Inc. p. 132. ^ "RFC 2635 – DON'T SPEW A Set of Guidelines for Mass Unsolicited Mailings and Postings (spam*):". Retrieved September 29, 2010. ^ a b c d Waxman, Olivia B. (July 5, 2017). "Spam Turns 80: History and Origins of Canned Meat". Time.com. Retrieved October 30, 2017. ^ a b "Spam Brand History". Spam. Retrieved November 27, 2016. ^ a b c Smith, Andrew (May 1, 2007). The Oxford Companion to American Food and Drink. Oxford University Press. pp. 559–60. ISBN 978-0-19988576-3. ^ a b "Burger King to Serve Spam in Hawaii". Yahoo! News. Retrieved July 5, 2013. ^ Howard Yoon (July 4, 2007). "Spam: More than Junk Mail or Junk Meat" (npr.org). ^ Stranska, Hana (July 24, 1994). "About Spam". The New York Times. Retrieved October 1, 2014. ^ Atkins, Annette (2008). Creating Minnesota: A History From the Inside Out. Minnesota: Minnesota Historical Society. p. 194. ISBN 978-0-87351-633-4. Retrieved December 13, 2010. ^ Smith, Andrew F., ed. (2012). The Oxford Encyclopaedia of Food and Drink in America. Oxford University Press. p. 343. ISBN 0199734968. ^ Heydt, Bruce. "Spam Again" . America in WWII, June 2006. ^ Ruvio, Ayalla A. (July 2, 2017). "How Spam became one of the most iconic American brands of all time". The Conversation. Retrieved July 6, 2017. ^ "Data Stream". Next Generation. No. 25. Imagine Media. January 1997. p. 28. ^ Kim, Sojin; Livengood, Mark (1995). “Ramen Noodles and Spam: Popular Foods, Significant Tastes” Archived October 6, 2014, at the Wayback Machine, pp. 2–11. Retrieved September 18, 2014. ^ "Spam Turns Serious and Hormel Turns Out More". The New York Times. November 14, 2008. Retrieved July 5, 2013. ^ "Hormel Foundation History". Thehormelfoundation.com. Archived from the original on December 3, 2013. Retrieved July 5, 2013. ^ Lovegren, Sylvia (2005). Fashionable food: seven decades of food fads. United States: University of Chicago Press. p. 190. ISBN 978-0-226-49407-4. Retrieved December 13, 2010. ^ Corum, Ann Kondo (1987). Hawaii's Spam Cookbook. United States: Bess Press. p. 135. ISBN 0935848495. Retrieved June 4, 2018. ^ "Spam – Hawaiian Spam Musubi". Whatscookingamerica.net. Retrieved July 5, 2013. ^ Song, Jaymes (June 11, 2007). "Burger giants wage Spam war". The Star. Toronto. ^ Huppert, Boyd (May 17, 2007). "Land of 10,000 Stories – Spam in Paradise". KARE11 News. Archived from the original on June 5, 2012. ^ "The Spam That Isn't Via E-Mail". The New York Times. April 7, 2003. Retrieved December 28, 2007. ^ "Welcome - Waikiki Spam Jam". Welcome. Retrieved June 14, 2017. ^ a b c Singh, Lakshmi (October 22, 2017). "Hawaii's Spate Of Spam Heists". NPR. Retrieved October 23, 2017. ^ "Why is Spam Brand a Household Name?". Archived from the original on October 10, 2014. Retrieved October 6, 2014. ^ "Organic smoke (and mirrors)". Saipan Tribune. July 21, 2006. Archived from the original on June 23, 2008. Retrieved June 21, 2009. ^ "A junkie waiting to happen". Saipan Tribune. July 14, 2006. Archived from the original on June 23, 2008. Retrieved June 21, 2009. ^ "Receta: Sandwichitos para fiestas". August 12, 2013. Archived from the original on October 7, 2014. Retrieved October 6, 2014. ^ "Tulip Food Company". english.tulip.dk. Archived from the original on August 14, 2009. Retrieved June 21, 2009. ^ "Spam—UK". Retrieved October 6, 2014. ^ "Spam Fritters" (PDF). Archived from the original (PDF) on October 10, 2014. Retrieved October 6, 2014. ^ Casey, Nell (December 16, 2016). "Stay Warm With Filipino Brunch & A Cookie Competition This Weekend". Gothamist. WNYC. Archived from the original on February 24, 2018. Retrieved January 20, 2019. ^ Escalona, Katrina (September 18, 2017). "Why Spam and Rice is a Filipino Food Classic". Culture Trip. Retrieved January 20, 2019. ^ Ke, Bryan (December 12, 2017). "Why Filipinos Love Spam So Much". NextShark. Retrieved January 20, 2019. ^ Agoncillo, Anna (September 29, 2016). "What Is SPAM And Why Are Filipinos Obsessed With It?". RemitBlog. Retrieved January 20, 2019. ^ Ong, Sherina (June 24, 2014). "SPAM: A story of love and hate". Rappler. Retrieved January 20, 2019. ^ Matejowsky, Ty (March 1, 2007). "SPAM and Fast-food "Glocalization" in the Philippines". Food, Culture and Society: An International Journal of Multidisciplinary Research. 10 (1): 23–41. ^ "Hormel Foods Announces Donation to Philippines". Web wire. October 8, 2009. Retrieved September 24, 2010. ^ a b "Spam's Long March in China". Bloomberg BusinessWeek. August 4, 2011. Retrieved October 6, 2014. ^ Sieg, Linda (March 12, 2008). "Okinawa cuisine: tofu, Spam and root beer". Reuters. Retrieved September 24, 2010. ^ "Hormel Foods Pledges to Relief Efforts in Japan". Reuters. March 17, 2011. Archived from the original on October 10, 2014. Retrieved October 6, 2014. ^ "Forget Spam fritters, now Burger King is selling Spam burgers… for women". Daily Mail. June 15, 2011. Retrieved October 5, 2014. ^ Bleier, Evan (May 1, 2014). "Burger King introduces Spam and cheese burger in Japan, for breakfast". United Press International. Retrieved October 6, 2014. ^ "Why is Spam served in Hong Kong diners on top of macaroni noodles?". HK Magazine. Retrieved October 6, 2014. ^ "In Korea, It's Spam Time of Year". ^ "스팸 (SPAM)". CJ CheilJedang. Retrieved November 14, 2016. ^ Walraven, Boudewijn; Breuker, Remco E. (2007). Korea in the middle: Korean studies and area studies : essays in honour of Boudewijn Walraven. Leiden: CNWS Publications. pp. 255–257. ISBN 978-90-5789-153-3. Retrieved December 13, 2010. ^ "Kosher Spam: A Breef History". Retrieved October 6, 2014. ^ "הצדעה ללוף, שייצורו הופסק באחרונה בישראל" [Salute for Loof, production of which was recently ceased in Israel]. mouse.co.il. Retrieved September 19, 2010. ^ Brown, Ray Broadus (2001). The Guide to United States Popular Culture. University of Wisconsin Press. p. 762. ^ Civitello, Linda (March 29, 2011). Cuisine and Culture: A History of Food and People. John Wiley & Sons. p. 347. ISBN 9780470403716. ^ Danelle D. Keck, Jill M. Sullivan (2007). "The Hormel Girls, American Music, Vol. 25, No. 3 (Fall, 2007), pp. 282–311". University of Illinois Press. JSTOR 40071663. ^ Hardill, Irene; Graham, David; Kofman, Eleonore (2001). Human geography of the UK: an introduction. London: Routledge. pp. 96–97. ISBN 978-0-415-21426-1. Retrieved December 13, 2010. ^ "Spam". Monty Python. Retrieved October 30, 2017. ^ "WEIRD AL YANKOVIC – SPAM LYRICS". Retrieved August 3, 2014. ^ The Oxford Companion to American Food and Drink. Retrieved October 6, 2014. ^ "TNR Film Classics: 'Sophie's Choice' (January 10, 1983)". newrepublic.com. Retrieved October 30, 2017. ^ "The magical, mystical world of SPAM - AOL Finance". Aol.com. December 29, 2008. Retrieved October 30, 2017. ^ "Singing Spam's praises". July 7, 2008. Retrieved October 6, 2014. ^ Hormel Foods (2010). "Spam Jam Waikiki 2010". Hormel Foods Corporation. Retrieved December 13, 2010. ^ Pitto, Christy (December 7, 2010). "Shady Cove issues- riparian, event insurance and liability". Upper Rogue Independent. Archived from the original on July 17, 2011. Retrieved December 13, 2010. ^ "Spamarama website". Retrieved August 11, 2006. ^ "What is Spam Classic?". Spam.com. Hormel Foods. Archived from the original on June 17, 2015. Retrieved September 18, 2014. ^ "Nutritional Facts and Analysis for Spam". Nutritiondata.com. Retrieved July 5, 2013. Wikimedia Commons has media related to Spam (food). Look up spam in Wiktionary, the free dictionary. Collection of mid-twentieth century advertising featuring Spam from The TJS Labs Gallery of Graphic Design. This page was last edited on 24 April 2019, at 13:38 (UTC).